Share the Love…. And the Fashion! So if there is a stylish lady in your life who would love us to wave our stylish wand over their wardrobe then a Gift Voucher is the perfect present! 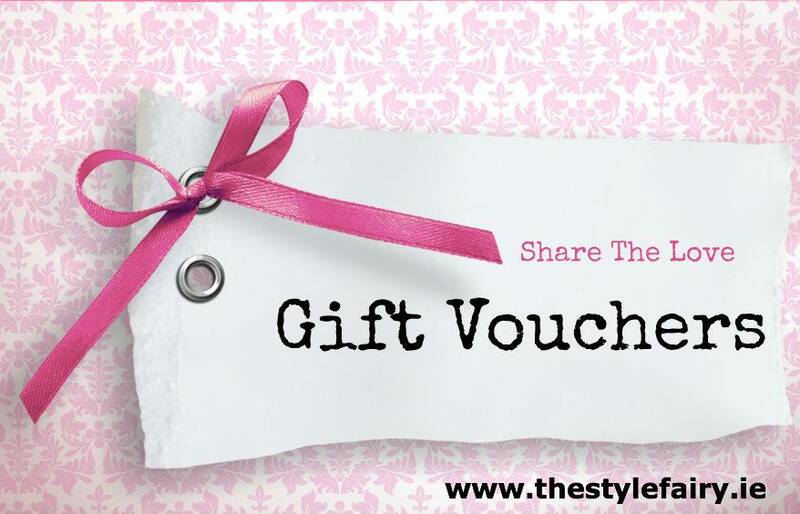 You can email us on info@thestylefairy.ie for more information or visit:http://thestylefairy.ie/product-category/gift-vouchers/ to place an order! Our stylish vouchers can be posted anywhere in the world (free of charge) and we guarantee to post them the same day you place your order! Visit http://www.thestylefairy.ie and head to “Services” for all the details on each styling service plus the prices! On the big day all eyes will be on the Mother of the Bride and equally the Mother of the Groom, well after the Bride herself, off course! There can be a lot of pressure put on mothers to look sensational and sometimes finding that perfect outfit can prove to be stressful. Women can get overwhelmed trying to find a look that is firstly flattering, as stunning as it should be, but also appropriate to such a big occasion. That’s why we offer a specific Mother of the Bride or Groom Shopping Service. With extensive retail and personal shopping experience in one of Ireland’s leading occasion wear boutiques, The Style Fairy Director, Naomi Clarke is excellently equipped to assist Mothers of the Bride or Groom find that all important look. We start by talking though the style of the wedding, the venue and all other wedding details, as all of this off course dictates the style of your outfit and will start to give focus to our search. We will also discuss colour schemes and what colour the bridesmaids will be wearing as well as what colour the other mother will be wearing. Once we have established this, we will get you (the mother of the bride or groom) to complete a very quick style questionnaire, this is just basically to find out your height, dress size, shoe size, colouring, budget and preferences. Once we have gathered all the information we need, it’s time to set the agenda and we will advise you on the best and most suitable boutiques for you to visit. The Style Fairy has extensive knowledge of all the best boutiques up and down the country. We will arrange a day and time that suits you and Naomi Clarke, The Style Fairy, will attend on the day with you to try on looks. It’s essentially having your own personal stylist on hand. This ensures you find a look that suits you; your style, your budget and your body shape and off course is perfect for your son or daughters wedding. Quite often some of the best boutiques are hidden gems around the country, depending on the mother in question and the style we are looking for, this service may see see visiting boutiques anywhere from Dublin to Belfast and everything in between. The cost per appointment is €165 – This includes all research and briefing in advance, as well as scheduling of appointments, attendance and all styling and assistance on the day. We allocate 3 hours per session, so in often cases (depending on boutique locations) this session can see us fitting in more than one appointment. The bride-to-be is welcome to attend along with us. These session are not only valuable, but they are always great fun and really get everyone in the wedding spirit! Whether you are a mum reading this or a bride-to-be helping her mum/ mum in law….Always remember it doesn’t matter your age or size, we ensure we will find you the perfect look. For more information or to have a chat with Naomi, please email us on: weddings@thestylefairy.ie or call us on 087 0606592. More information is also available on our website here. The day has come, the day you have probably always dreamt about. You’ve found the perfect guy, you’ve booked your dream venue, now it’s time for ‘THE’ dress. It’s one of the most exciting, brilliant, memorable yet daunting experiences you will ever have. Cherish it. There is no such thing as “settling” when it comes to your wedding dress, only perfection will do. When you find the ‘one’, you will definitely know. But sometimes it’s a long and occasionally stressful road to finding that perfect wedding dress. The Wedding Fairy, our nuptially obsessed alter ego, offers a Bridal Styling Service which is ideal for today’s modern bride. When you book us, the ball starts rolling on the hunt for the perfect dress. As part of the Wedding Dress Shopping Service, we discuss shapes, styles and wedding dress designers with you in advance to get an idea of what you think you might want (bare in mind we encourage you try on lots of styles). As well as this, we will talk you through all the best bridal boutiques in the country, from our experience we have built up an excellent black book of the best bridal boutiques up and down the country that we will share with you. Once you have decided where you would like to go, The Wedding Fairy will schedule and book your wedding dress appointments for you, making sure they are at a convenient and suitable time for you. We then attend the appointments on the day with you. Meaning you have your own personal bridal stylist on hand to help you find the perfect wedding gown. The cost for this service is €165, and this is based on two appointments. Quite often these appointments see us travelling outside Dublin, to some of the country’s best Bridal boutiques both well known and the not so well known. We promise that with our knowledge and experience of the wedding market, we can ensure you find the dress of your dreams. Once you have found the beloved dress, we can also assist with your fittings and any alterations that may be needed. We also offer an excellent Accessories Shopping Service where we focus on finding you all the added extras which make the look complete. From veils and headpieces to shoes and jewellery, we promise to take care of it all. For further information or to book, email us on info@thestylefairy.ie, call us on 087 0606592 or visit our website here.